2018 IndyCar Series rookie Zach Veach will be the featured guest on Oct. 26 for “Fuel Up Fridays,” 8-9 a.m. (ET) at the Indianapolis Motor Speedway Museum. “Fuel Up Fridays” is an IMS Museum members-only opportunity to get to know IMS and IndyCar Series personalities in an intimate setting, through a one-hour question-and-answer session hosted by IMS Historian Donald Davidson in the Museum’s Gallery. Complimentary coffee, donuts and pastries will be available when doors open at 8 a.m., and the program will get underway at 8:15. 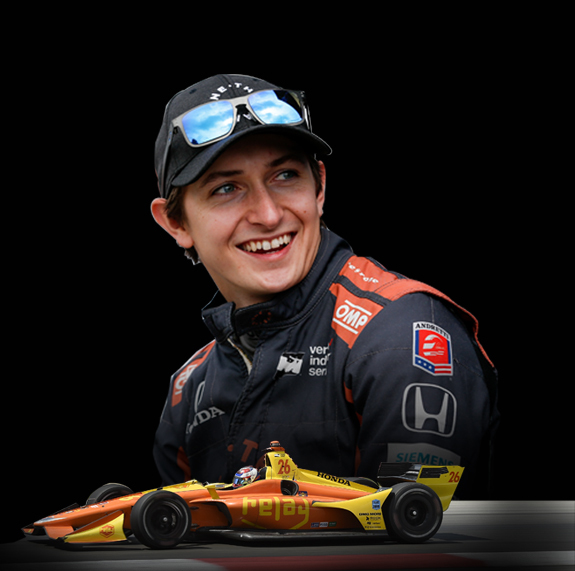 Veach, one of the IndyCar Series’ rising stars, is a native of the small southern Ohio town of Stockdale. He competed as a rookie in the 2018 Verizon IndyCar Series driving the No. 26 Group One Thousand One Dallara/Honda/Firestone entry for Andretti Autosport. Veach displayed remarkable consistency and pace, finishing all 17 IndyCar Series events while posting five top-10 finishes, and narrowly missed the podium at the prestigious Toyota Grand Prix of Long Beach by finishing a career-best fourth. He made his IndyCar Series debut at Barber Motorsports Park in 2017, driving for Ed Carpenter Racing, and finished 26th for A.J. Foyt Racing at the 2017 Indianapolis 500. As with many accomplished IndyCar Series road racers, Veach started racing at age 12, in go-karts, earning championships in Ohio and Indiana before moving through the IndyCar ladder system with Andretti Autosport, first in the USF2000 Championship and then Indy Lights, where he collected numerous victories and pole positions. To RSVP for Fuel Up Fridays with Zach Veach, please contact Kelly Hartman at (317) 492-6568 or khartman@brickyard.com. The event is open to all IMS Museum membership levels and interested parties can join Oct. 26, in person, prior to the event. Membership information is available by contacting Hartman or visiting the Museum’s website at www.indyracingmuseum.org. About the IMS Museum: The Indianapolis Motor Speedway Museum is home to one of the world’s premier motorsports and automobile collections, with emphasis on the Indianapolis 500-Mile Race and IMS’s other world-class events. Located inside the famed 2.5-mile Indianapolis Motor Speedway oval, the Museum is open 363 days a year (closed Thanksgiving and Christmas). It is a 501(c)(3) organization which relies on support from admissions, tours, sponsorships, annual memberships and planned-giving for its programming, restoration and preservation efforts, and special events. For more information on the IMS Museum, please visit www.indyracingmuseum.org, contact the Museum at (317) 492-6784 for find us on Facebook, Twitter and Instagram.